End of the Weak Montreal in Montreal or Quebec City? 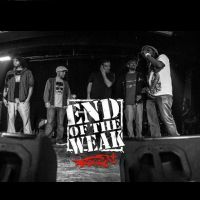 Inform me about the next events for End of the Weak Montreal. Enroll yourself to our priority waiting list for End of the Weak Montreal to be alerted when new tickets are available. Filling this form doesn't engage you to any purchase. End of the Weak is a competition that comes to us from New York City. It's a "battle" style competition where two artists "battle it out" on stage to become the best hip-hop artist. There's five categories to the competition : Free Text, A Capella, Improvisation, MC versus DJ and Cypha Skills. EOW is an international competion that made it's entrance on the canadian scene with stops in Vancouver, Toronto and Montreal. They'll be at Divan Orange in September 2015.